XamorahLunaris has started a donation pool! Hey there, I'm Kandace! (Also known as LPSlover from YouTube. This is my official DeviantArt!) 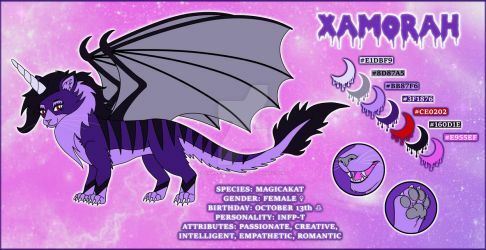 My main character Xamorah is my fursona. She is a magicakat (magical bat winged unicat hybrid). I'm a storyteller, voice actress, puppeteer and film maker. I enjoy creating art of many forms such as writing, drawing, painting, sculpting, costume building and photography. I post journals here on DA as blog posts/thoughts/updates to keep my friends and fans of my creations updated.